Our guest today is Jen Bryant, award-winning children’s book author whose book The Right Word: Roget and His Thesaurus won both the Sibert Medal and a Caldecott Honor at this year’s ALA Youth Media Awards. Bryant is also author of A River of Words: The Story of William Carlos Williams (another Caldecott Honor book illustrated by Melissa Sweet) and Georgia’s Bones. In today’s edition of Five Questions, Jen tells us about where she was when she got “the call” and some of her favorite things about words, The Right Word, and reading. Where were you, what were you doing, and how did you feel when you got the Sibert phone call? I was at home slicing hoagies for our annual neighborhood Superbowl party. The phone rang and I saw on the caller ID that it was a number I didn’t recognize, so I almost didn’t answer it! Luckily, I decided to pick up the phone, and when I did, it was Deb Taylor, the chair of the Sibert committee!!! The other eight committee members were in the background, cheering and clapping. When Deb told me that The Right Word had won the Sibert Medal, I was completely overcome (stunned, dumbfounded, incredulous, cotton-in-the-mouth, bedazzled.) At first I sat down, then I paced, and then I started dancing around the room. After I hung up, I had to act nonchalant; except for sharing the news with my husband, I had to keep the information to myself until the public announcement of the awards from Chicago that next morning. That was difficult, because less than a half hour later, we had a basement full of friends and neighbors to watch the game. What is the most fascinating thing you learned about Roget that made it into the book, and what is the most fascinating thing that didn’t make it into the book? For me, the most fascinating thing about Roget was the immense scope of interests he had, as well as the number of disciplines in which he excelled and contributed in some significant way. For example, he became a physician when he was still a teenager; he could read, write, and speak in several languages; he was an expert in natural history, botany, and anatomy; he studied optics and contributed to the early development of motion pictures; he invented a version of the slide rule for advanced mathematical calculations; he invented a portable chess set. We managed to fit most of that into the book, either in the narrative itself, or in the art, or in the back matter. The most fascinating thing about Roget that didn’t make it into the book was this amusing paradox: despite his social anxiety and, at times, extreme social awkwardness, he remained a popular guest at many London soirées and received considerable attention from the young single ladies. At one particular party, he discovered that he was a very good dancer and the physical activity also served to calm his nerves. What’s your favorite entry in the thesaurus? An entry in Roget’s original thesaurus. What do you hope young readers take away from The Right Word? The magical thing about reading is that every reader brings their own life experience and personality to the story — and those things influence what they take away from it. For someone who is wildly curious, Roget’s fascination with so many different areas of thought and imagination (natural science, math, language, optics, chemistry, etc.) will be what they identify with the most. For a reader who has had to move around a lot, or has had a lot of loss and disruption in their lives, Roget’s quiet resourcefulness will be what they notice. For lovers of language, writing, and list-making, the book will inspire them, perhaps, to create their own original book of word lists! And for others who are very shy or who fear public speaking — Roget’s ability to face those very fears in his own life will be encouraging. In general, though, I hope every reader gains a new understanding of, and appreciation for, the man who created the “little book of synonyms” that sits on their library shelf. I was sure I was going to be a veterinarian when I grew up, so I read all kinds of books about animals: wolves, bears, tigers, penguins — but also dogs, cats, birds, reptiles. As a teenager, I was obsessed with horses and horseback riding, so I read anything and everything I could get my hands on about that topic, whether it was fiction or non-fiction. My favorite childhood series was The Black Stallion, by Walter Farley, which follows the adventures of a horse and a boy who survive a shipwreck and develop a lifelong bond. They have many subsequent adventures as new equine and human characters are introduced. I remember racing down to my public library as soon as a new book in The Black Stallion series became available so I’d be the first one to read it. 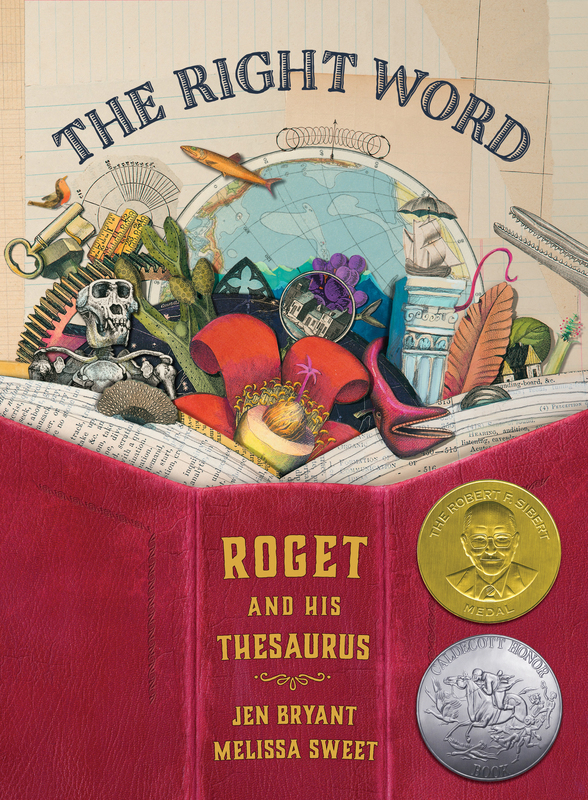 In fact, I was remembering that very feeling when I wrote about Roget’s thesaurus and how people grabbed it off the shelves like a new kind of candy. I hope people always feel that way about their favorite books! Learn more about Jen Bryant by visiting her author website and her author Facebook page. You can also read her first Eerdlings guest post, “Of Pestilence, Poetry, and Prose,” and order her award-winning book The Right Word.